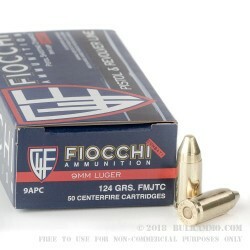 This Fiocchi 9mm ammo is great for high volume shooters who want consistent quality at the range and at competitions. Featuring a 124 grain full metal jacket with a truncated cone, this bullet's profile is good for shooting competitions leaving cleaner scoring than typical fmj round nose profiles. Also, compared to wadcutter shaped bullet profiles this profile tends to feed more consistently making it a good hybrid of sorts between a wadcutter design and a more typical FMJ profile. 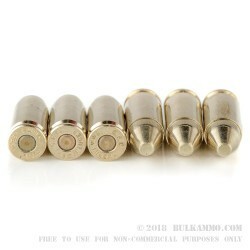 This ammo is brass-cased, boxer-primed, and reloadable. Fiocchi ammunition was founded in 1876 by Giulio Fiocchi and to this day is still operated by many of his descendants in both Italy and in the US. 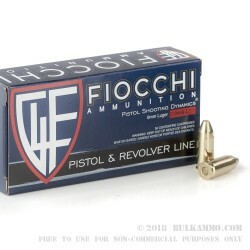 As Fiocchi's acceptance has grown since the mid-2000's it has increasingly loaded its ammo in Ozark, Missouri where excluding rimfire ammo the vast majority of its ammo is now US loaded.